If you are thinking of remodeling your bathroom, then consider giving it a modern stylish look with a vessel sink. You can turn your ho-hum bathroom into an extravagant spa-like area with a new sink fixture. Vessel sinks give you the same functionality as a standard drop-in or inset sink, but their eye-appeal sets these sinks above all other options. 2.1 What are Vessel Sinks? 2.2 How to Install a Vessel Sink? 2.3 Where to Buy Vessel Sinks? The biggest benefit of a vessel sink is the “wow” factor it brings to your bathroom. 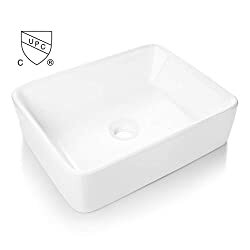 There are many kinds of vessel sinks available, and we have provided reviews of our favorite vessel sinks available in the marketplace today. Take a look at the products below and see if any of them catch your eye as an option for your bathroom upgrade project! This is a premium quality ceramic above counter vessel sink from AWESON. It measures 16-inches by 12-inches and has a basin depth of 4.75-inches. It has rounded edges and a sleek glossy surface which is easy to clean. The sink does not have an overflow drain, and it does not include faucet holes. The sink requires an accompanying wall-mount or counter-mount faucet to be installed with it. It does not come with a pop-up drain so you will need to buy one separately to install with this sink. If you are looking for a way to give you bathroom an uplift, then consider this vessel sink. It will smoothly blend in with any bathroom decor! 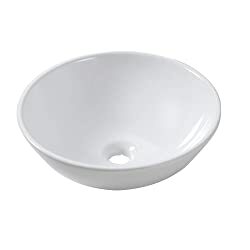 This is a lovely white oval vessel sink from KINGO HOME. 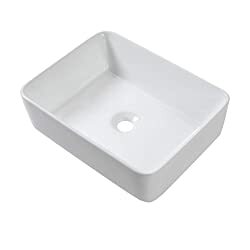 The basin of the sink is only 5.5-inches high and is about 16-inches wide. This is a perfect countertop sink for a smaller guest bathroom or a powder room. It has a non-porous glossy surface which is easy to clean and scratch-resistant. The center drain location gives you optimal water drainage capabilities, and you can select the type of pop-up drain that suits your taste the best and fits in with your bathroom decor. This sink does not contain an overflow drain. This frosted tempered glass vessel sink will transform your bathroom from an average every-day room into a spa-like environment! The simple round shape of the basin and the frosted glass makes the sink look large and elegant. The tempered glass is a high-quality material and is 0.5-inches thick which ensures against glass breakage and chips. This product comes with a chrome pop-up drain and mounting ring. It also includes a single-lever chrome faucet which installs directly onto the countertop or vanity. PULUOMIS offers a 1-year limited warranty for this product which makes it a risk-free option for you to try out in your bathroom remodel project! This beautiful artistic vessel sink from PULUOMIS will add charm and elegance to any average bathroom. The artificial hand-painted brown pattern of this sink will allow your bathroom vanity to shine and the glossy surface is easy to clean. The tempered glass is 0.5-inches thick and is about 5.5-inches deep. This product includes a pop-up drain and mounting ring. The faucet has an oil-rubbed bronze finish to enhance your bathroom and set it apart from all other bathroom upgrade options. The faucet height is 12-inches from the countertop and sits high enough from the sink to allow enough room to wash your hands. PULUOMIS offers a 1-year limited warranty on this product. If you are looking for an elegant way to uplift your bathroom, consider this beautiful product from PULUOMIS! This is a sleek European inspired rectangle vessel sink from Lordear. This contemporary sink is made of premium quality ceramic construction with a scratch-resistant polished surface. It’s resistant to stains and is easy to clean. 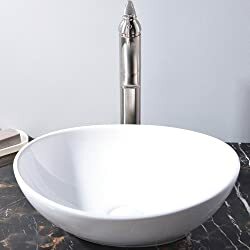 This sink is an impressive 19-inches wide and 5.5-inches deep giving you plenty of space to get your hands under the faucet. Lordear back this product with a 100% money-back guarantee if you are not satisfied for any reason. This sink is a perfect solution for small bathrooms or powder rooms that have a tight fixture configuration. The sink is 18.1-inches long and 10-inches wide. It mounts directly to the wall and has one hole for the faucet to be mounted. This product includes a single-lever chrome faucet made of solid brass. It also includes a pop-up drain with a chrome finish. The modern design of this sink will fit in seamlessly with any bathroom decor. The sink is designed to mount to a solid wall, so be sure you have a solid surface to mount this to before you buy it. If you are looking for a sink to provide you with more space in your small bathroom, then consider this product from Walcut! 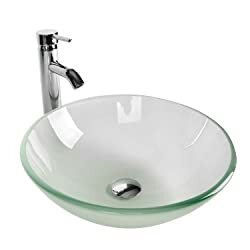 This is a unique square clear glass vessel sink from Aquaterior. The unique design of this tempered glass will give your bathroom a sleek modern look that is incomparable. The sink is about 16.5-inches in length and width with a 5.5-inch sink depth. This transparent sink is an above counter installation and requires a counter-mount faucet. It does not include an overflow drain, but has steeply sloped sides to ensure full water drainage from the basin. The glass is 0.5-inches thick which protects the sink from breakage and chips. It is easy to clean and will give you years of long-lasting performance! This is a rectangle above counter vessel sink from Lordear. The dimensions are 16-inches by 12-inches and it has smooth rounded edges to give a sleek modern look to your bathroom. It has a glossy stain-resistant surface and is easy to clean. 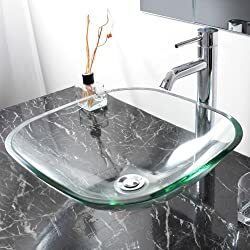 This sink sits nicely on top of a countertop or vanity and works best with tall faucets to ensure enough space below the faucet for washing your hands. Lordear provides a 100% money-back guarantee on this product for any reason. You can buy this vessel sink risk-free knowing you can return it if you have any problems with the sink performance or functionality! This is a European inspired modern sink which is mounted above the counter. The smooth vitreous china design gives this sink a sleek appearance. It is easy to clean and the glossy surface is resistant to scratches. It has a rectangular shape stretching to just over 19-inches wide. It fits a standard 1.75-inch center drain hole. The stain-resistant surface will keep its glossy finish for years giving your timeless durability. 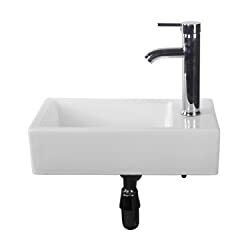 If you are looking for a sturdy above counter vessel sink, then consider this rectangular sink from KES. It is 19-inches wide and just over 5-inches high. The sink has sloped sides and rounded edges giving you a modern upgrade for your average bathroom. This sink is perfect for a side-by-side his and hers sink installation. It will provide a beautiful sleek appearance for your bathroom and will blend in smoothly with all other fixtures and bathroom decor. There are several things you should understand about vessel sinks before you buy one. We have tried to answer some basic questions for you here. 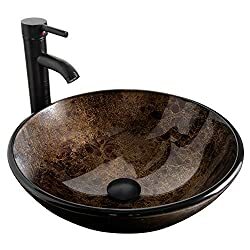 You have heard of a vessel sink but do you really know what that means? A vessel sink is known by many names. You may hear them referred to as a bowl sink or above counter sink. These terms all mean the same thing. A vessel sink is a basin or a bowl that sits on top of the bathroom vanity or counter. Non-vessel sinks are inset into the vanity and are considered drop-in or undermount sinks. Vessel sinks make your bathroom look more modern and stylish. They add a “splash” appeal to your bathroom that regular inset or drop-in sinks cannot match. 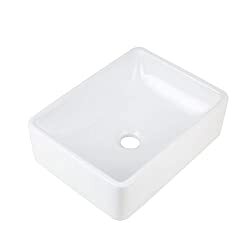 How to Install a Vessel Sink? Before you install a vessel sink, you need to prepare the vanity, dresser or countertop where your vessel sink will sit. If you are using a piece of furniture that is not designed specifically for a vessel sink, you may have to make some modifications to the furniture item in order for the sink to work. For example, if you are using a clothes dresser for your vessel sink, you may have to remove and disassemble the dresser drawers and leave only the drawer face intact. This allows room for the water and drain lines inside the dresser. Step 1: Be sure you have the correct drain fitting for the sink drain. If the sink includes an overflow drain, make sure the drain fitting has an overflow passage built into it. If the sink does not include an overflow drain, then you need a drain fitting without an overflow. Step 2: If your sink comes with a mounting ring or gasket, then place the mounting ring over the drain opening and position the sink on top of the gasket. If a mounting ring is not needed, then you can position the sink directly on the countertop. Step 3: Attach the drain fitting to the sink. You may need an extra pair of hands to help you hold the vessel sink in position. Step 4: Connect the drain trap to the sink’s drain fitting. Step 5: Connect your water supply hoses. Step 6: After all connections have been made, test the drain for any leaks. Step 7: Your sink is now ready for daily use! Where to Buy Vessel Sinks? There are so many options available for buying a vessel sink. There are many online retailers that carry vessel sinks and some even include free shipping! You can also visit any of the major do-it-yourself hardware stores. If they do not have what you want in stock, some of them can check other stores or even check with their national warehouses to see what other options can be shipped directly to their store. You can even find vessel sink options at kitchen remodeling and plumbing supply stores. Check in your own local area for a plumbing supply store and see if you can find some vessel sink candidates that will fit in with your bathroom decor. 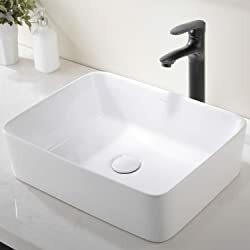 If you are interested in a vessel sink for your bathroom, then you now have all the information you need to make an informed decision on the best option. Remember to consider the size and shape of the sink you need. You want to select a sink size that does not overpower your bathroom space. You will have fun giving your bathroom a new modern look!